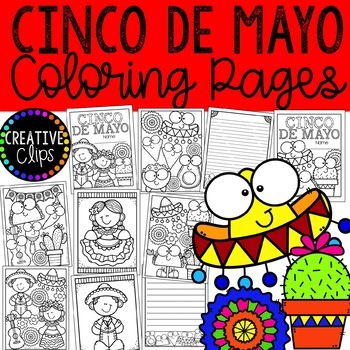 This coloring book includes 2 coloring book cover choices, 8 unique coloring pages, as well as coordinating writing papers that offer differentiation for your little writers- all with a fun Cinco De Mayo theme! This coloring book is NOT included in any of my Coloring Book Bundles. This product is for PERSONAL USE only and cannot be copied, redistributed or posted for others. Check out my other coloring books to see examples of the quality graphics and crisp designs you will receive! Unlike many listings in my TpT store, this is not clipart and CANNOT be used in any way for your own products or freebies. Please remember that creating your own coloring books for commercial use or freebies is not permitted under my TOU. This coloring book is available because it was created directly by myself, the original graphic artist. If you like the graphics in this coloring book, please check out my TpT store for other seasonal and year-round graphic sets to create other types of educational resources.